NEWINGTON – A modest, middle class suburb of Hartford, there is no shortage of generosity in Newington. Those who have enough – give, and those who can – do. 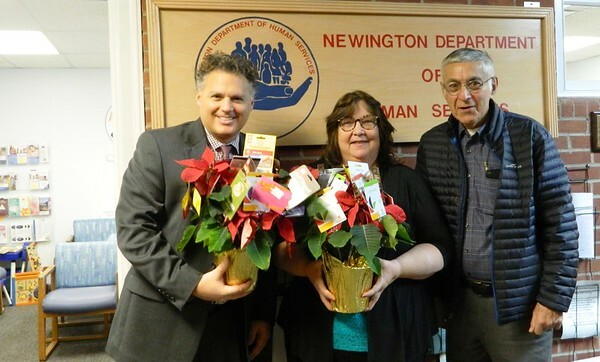 Newington Human Services staff reported a countless number of donations over this past holiday season. Additionally, numerous volunteers helped sort, package and wrap gifts for the department’s annual Holiday Gift Distribution. Gifts were distributed to 420 households, comprising 900 individuals. Some of them were large families with children; others single parents, married couples or elderly people living alone. All of them are facing financial hardship. Human Services’ financial assistance programs, including the Newington Food Bank, back-to-school and holiday gift distributions, Thanksgiving baskets and fuel assistance, are available to residents living under the 235 percent poverty guideline. For a family of four, this means earning less than $44,862 a year. An individual earning below $26,250 annually is equally eligible. They come to Newington Town Hall to take home gifts. They can also pick from a table of extra, generic gifts set up by volunteers. The shelves of the food bank are especially full during this visit, to ensure holiday tables are abundant with food. Food Share provides much of the food bank stock, but otherwise every can of green beans and every gift-wrapped toy arrives via donor. “We are very fortunate Newington responds on a passionate level to the need identified,” LaBrecque said. State Rep. Gary Byron was not elected to another term at the Capitol in November, but that didn’t stop him from helping residents in need come December. Byron and Newington Mayor Roy Zartarian delivered 31 gift cards, all for local restaurants and businesses like Price Chopper, Panera Bread, Joey Garlic’s and CVS. They were purchased by members of the Newington Republican Committee. “Hopefully this is the start of a wonderful annual tradition,” Zartarian said. The idea came from Town Councilor Tim Manke, as an alternative to the typical donation of toys or canned goods. Human Services gets referrals from Newington police about homeless people and families. A dinner out to a restaurant is a welcome gift for these folks. While Newington Republicans took the opportunity to give a large donation as a group, Byron thinks people should give just because. Posted in Newington Town Crier, Newington News on Thursday, 3 January 2019 08:13. Updated: Thursday, 3 January 2019 08:15.